Renovation professional Stephen Davies shares two scenarios in the planning application in France that he has been involved in recently and highlights the sort of situations that can happen along the road to a renovation. Having been contacted by a client to obtain planning consent for a barn they were buying for conversion, I duly prepared a dossier consisting of forms and appropriate drawings and, after approval by the clients, submitted all to the Mairie and from there onto the local DDT/E (planning authority). A month after submission I was asked by the planners for more information regarding the position and access to the plot from another roadway which ran alongside the plot – we had used the existing access and were not wanting to use this route onto the property. Once this was cleared up we awaited final approval. This duly arrived three weeks later. I was surprised, not to mention concerned, by the reaction of the clients. They expressed some measure of annoyance and disgruntlement at the length of time the application took to be passed. Having been assured by the agent immobiliere that as the property had a certificat d’urbanisme in place, planning would be a formality and take “no time at all”. Consquently they had contacted and arranged builders to start the intended works at the point of sale – at the acte de vente stage. When I explained that the timings of a permis de construire dossier between submission and approval can be a minimum of 2 to 3 months, this came as some surprise to them, in spite of the fact that I had explained this to them at the point of preparation. They had checked this with the agent who was selling them the property who had assured them that I was being “overcautious” and a lesser time frame was to be expected. Although it is possible that a Permis de Construire can take a shorter length of time from deposition to approval (I have had a P.C. application passed in 18 days!). It would be wise to allow plenty of time to obtain any planning authorisations before arranging artisans or trades for any proposed works. I was asked by some clients who were a long way down the buying route to check out the terms of reference for the certificat d’urbanisme for the property they were buying and produce some plans from a set of sketches they had prepared following their site visits and investigations. 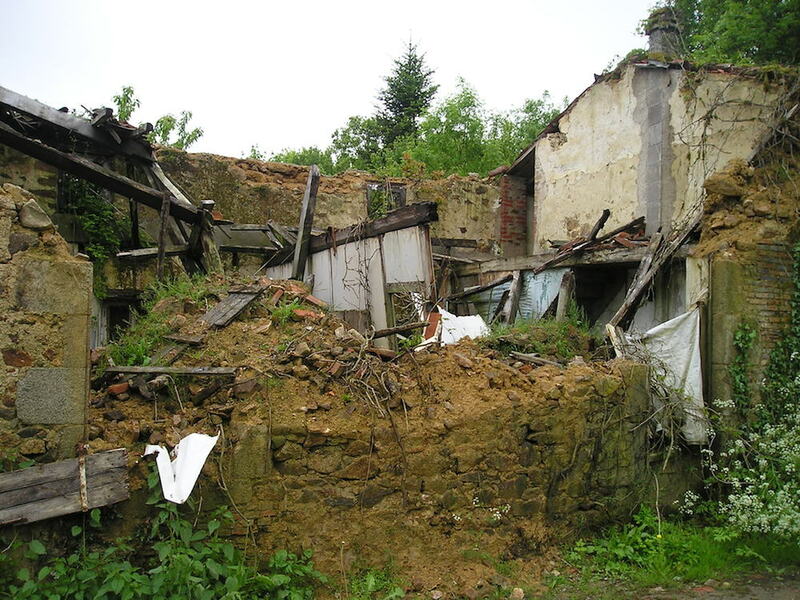 Looking at the photos provided, the “house” was in a very dilapidated condition. The roof had fallen in, external walls were crumbling and cracks in all masonry were running through from floor to ridge-height in all remaining walls. At this point I made a site visit and compared existing structure, what was left of it, to the proposal provided by the clients. It would be fair to say that one bore no relationship to the other in terms of dimensions, layout and form. What they were in fact hoping to do was demolish the remains of the existing structure and build a new house. In size, form and construction this was directly opposite to what the CU operationelle stipulated they could actually do with the property. The document stated that they were only allowed to renovate the existing structure. When I asked them about this they replied that the immobillier had told them that the build was in such a poor condition that demolishing it and building would be allowed as it was the “only real option” as planners could not expect anyone to repair the house as it was. This was patently not the case. I arranged a site visit with the local planning officer who confirmed my view that the building as it was could only be renovated but he would allow an extension within the limits of the footprint to extension ratio. In this case 30%. In spite of this being reported to clients they were still insistent that a new house could be built on the plot once the old building had been removed as the agent had told them so. On this assurance they continued with the purchase and signed and paid for the property. I then produced a compromise set of plans for the build. This involved some of the walls in a bad way being “renovated” down to ground level and an extension being added to give them somewhere near the levels of accommodation they wanted from their house. These went through several revisions in discussion with planners and clients to eventually get to a compromise between what planners would accept and what clients wanted. A permis de construire dossier was then produced and approved. The common denominator in both these scenarios is the fact that both sets of clients were assured by professional agents that their intended timings and outcomes were all achievable and could be taken as read. I would venture to suggest that a more thorough review of information received, with perhaps advice sought from an independent source, may have highlighted these problems before they became so complicated. There are many avenues of exploration and investigation that can be utilised to ensure any property purchase is as sound and secure as you would want it to be. The advice offered by agents selling the property given in good faith, may, sometimes, be tinged with an over-optimistic view and taken by clients on face value because it is what they are wanting to hear. Any circumstances that gives cause for concern can and should be verified with agencies such as planners or the local Mairie. This will ensure that any potential problems can be factored into the equation early enough in the process to seek the advice and guidance at an early stage to confirm whether or not carrying on with the purchase is right for the individual. •With thanks to Stephen Davies, FrenchEntrée contributor on building and renovation matters in France. Stephen runs Renovate in France and works full time as a designer planner and project manager on renovations and new builds. Yes, Steve is absolutely right. I have been submitting planning applications for clients for 10 years and I never cease to be amazed at the cavalier attitude of some clients! Sometimes the local maire tells them what they want to hear, sometimes it is our friends the immobs., sometimes the clients themselves have become planning experts whilst checking their smartphone on then ferry. I have started issuing a comprehensive explanatory leaflet to all new clients, but whether they read or take any notice of it, is anyone’s guess. Incidentally, my record for a PdC is 3 days. Yep, you read that right! !